Ready to take the GACE? Our test questions and worked-out solutions are developed by professionals familiar with the GACE. Prepare for the GACE Program Admission tests in Reading (200), Mathematics (201) and Writing (202) with our comprehensive instruction and 12 full-length practice tests. You&apos;ll get hands-on experience with different question types that you&apos;ll see on test day. In addition, you can view your results after you complete the practice test and get detailed explanations of correct answers to the practice questions. The instruction is flexible, so you can begin working through the material from the beginning covering all sections, or you can navigate to areas of specific need. We decided to place the testimonials right where you can find them not only as a thank you to those who have put in their hard work, but also for those of you who have yet to take the GACE and may need some inspiration and/or confirmation. All of the testimonials you see below are from individuals who used our GACE preparation program. "Thanks so much for your help! I passed the writing portion of the GACE Admission test with a score of 263. I found the longsdale publishing website extremely helpful and easy to use. The writing tips included in the writing portion of the website helped me to compose and organize a proficient essay in a short period of time. It was also beneficial that I received feedback on two sample essays. The feedback helped me to approach the test with confidence. I would recommend this website to anyone looking to past this test. I would&apos;ve passed without it!" "I am a highly educated individual with a masters degree and a long history of work within the corporate sector. It was after an injury that I chose to transition into the education sector, which required a series of assessments that are still currently underway. Having always struggled with standardized test anxiety, I was no stranger to the Test Prep market as a whole: its offerings, shortcomings, etc." "It was in my recent pursuits as an educator that I sought a helpful GACE Assessment Preparatory resource. After 3 other servicers failed to adequately assist me, did I happen upon Longsdale Publishing. My expectations weren't that high given how affordable they were, esp in contrast to the competition I had the displeasure of experiencing prior." "I took the first of my 3 exams yesterday, and I entirely credit them with my near perfect score. Thank You LP. I can't brag on them well enough to do it any real justice. You simply have to see it for yourself. Also, unlike other sites that are flashy, super interactive, very costly though simultaneously ineffective, it's Longsdale's simplicity that is refreshing. It is their customer service that just so happens to be as impressive as the programs they offer." "I would highly recommend Longsdale Publishing to anyone in search of a top notch preparatory program. While I can only speak for the GACE Assessments with 1 under my belt, and 2 left yet. 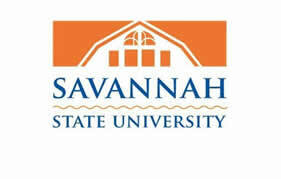 If that program is any indication of their offerings as a whole, which I suspect it is, you will be in great hands!!" "I took the GACE twice before I FINALLY passed it. I honestly believe if it were not for Divine intervention AND using the GACE Preparation Program study materials, I would still be attempting to pass. I am thankful for the assistance and help I received!" "Longsdale GACE Preparation Online Courses are extremely helpful and essential when studying for the GACE. I took two reading tests in one day and passed the reading part of the GACE the next day." "I am so happy that I found your material. I bought a few other study guides and they are pale by comparison. I passed the GACE basics the very first time I took the tests! YEAH!" "I am in the process of changing careers and wanted to get the process rolling ASAP. The investment in your material is well worth the cost. Not only did it help me save money by not having to re-take any of the tests, I was able to study at home, on my lunch break, and vacation." "Thanks for the help and confidence boost I needed!" "I took the math portion of my certification last month. Today I received my score and I passed the test!" "I owe it all to the practice tests that I obtained from Longsdale. Their realistic examples are closer to the real test than any other study data that I have come across in my year struggle to pass all three portions of the test." "Thanks so much! Please keep updating the test for all the future teachers. Ladies and gentlemen this is the study material you need to get! It has been helpful and the key to my passing and I know it will be for you too!" "I passed with flying colors! Thanks your great GACE prep tests! I scored ++++ in all categories (Reading, Writing and Math), except one in reading analysis (which was +++)." "I graduated from college 25 years ago and needed a comprehensive reading, math, and writing program to get my skills back in shape for testing. I had only 2 weeks to prepare for all three GACE Basic Skills Exams and the Longsdale Publishing GACE On-line course was a lifesaver!" "The content was excellent preparation for the exams and I was able to pass on the first try. Great course at a great price; and great service when I emailed them questions. I highly recommend the GACE On-line Course!" "Hint: Timing is a key factor. After a couple pages, I wised up and read the questions first. Then, I read only the passages that pertained to the question asked. I was able to blast through the test in 40 minutes and use the extra 20 minutes to develop my writing essay." "Hint for writing essay: Read question before beginning the Writing Multiple Choice portion. Jot down a couple ideas. Then let your subconscious mind work on the writing essay while you are answering the multiple choice questions." "I will gladly say that the GACE basic skills practice test really helped me out. For the things I had forgotten it refreshed my memory. The practice helped so much that I passed the GACE basic skills the first time I attempted each part of the test. I would strongly recommend the program to anyone." "The GACE course through Longsdale publishing has been my ace in the hole for passing the reading and writing exams. I took the test several times prior and it was hit and miss for what the test would really be like. Your practice tests really keyed into the different questions that gave me the edge and confidence I needed to pass. I passed both exams after studying your GACE practice tests. I am now studying for the math portion and feel confident I'll do well. I'll let you know how I do and will probably write a more detailed testimonial. Your course is the closest to the actual test I have experienced." "When I started hearing horror stories of the large percentage of failure rates associated with this exam, I knew I needed help. I was amazed at how much I had forgotten since college. I purchased several "packages" with promises to help me pass the GACE that were cumbersome and confusing. Only your program has been easy to follow, concise, follows the GACE material exactly and has provided me with a "snapshot" of what the exam will really be like." "I recently used the GACE Online Course and Practice Tests for all three Basic Skills Assessment Exams. I passed the exams on my first attempt. I have never been a teacher and I graduated from college over thirty three years ago. Thank you for offering a superb product and I would recommend it to anyone needing help." "Thank you very much for offering the GACE Online Course. I did not have any surprises because I already knew what to expect. The Mathematics part of the test was so much easier thanks to this course. I would recommend it 100%." "This Gace online course is absolutely GREAT! I searched other study guides before finding this site, but they all got bad reviews so I kept looking. I was initially impressed with the fact you are able to get a feel for what you're purchasing through the demo, which covers the objectives of the test that align with the GACE website. I was personally concerned about passing the math test, and thanks to Longsdale it was a breeze! If you do well on the practice tests offered by this course, you will have no problem with the GACE Basic Skills, despite the horror stories. I would recommend this site to anyone. I only WISHED they offered study guides for the content assessment portion of the GACE! Oh, by the way I passed all three parts of the test(Reading, Writing, and Math) the FIRST time!" "I am glad that I ordered the Gace Math Online tests. I am sure that my scores increased due to practicing taking the tests. 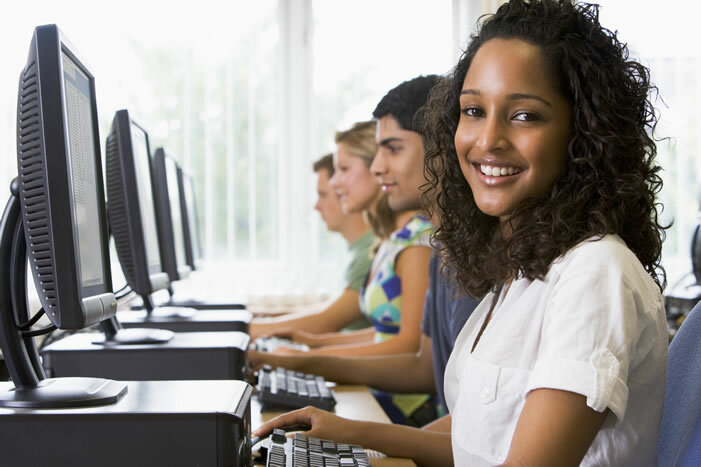 I would recommend this website to anyone before taking any parts of the Gace exams." "I had only ONE week to get ready for the GACE Basic skills test and i passed all three sections the first time! I am absolutely horrible at math but this program really laid out everything for me. I got a four on all three sections! Thank you so much for this program!!" "The GACE online course was an extreme study tool for the Reading section of the Basic skills GACE. The Reading section I found difficult but with the online course and practice test it helped me be better prepared and successful. Also, I used the online course for the Math section as well and found it to be an outstanding study guide. I struggle in math but this has helped considerably. I have not yet received my score yet for the math section, but I feel very confident I passed. Thank you again for this useful tool. I plan to graduate December 11,2010 from Piedmont College Athens Georgia." "After raising my children, I decided to go back to school to be a teacher. I was worried that I had forgotten everything, especially math. After taking the Longsdale Publishing class, I passed on my first try, with a perfect score in math. It was a great decision and I would recommend it to everyone." "The online course and practice tests were the perfect preparation for taking the GACE basic skills test. I did not attend high school in the United States since I grew up in Europe, and I was very worried about the math portion of the test. I passed the test easily, and my scores were excellent." "I took the Math GACE test along with my other two tests and did not pass Math. I am not good at Math at all, so I really did not know how I would be able to pass it. I found the longsdale publishing website, and decided to give it a try. Honestly, I would not have passed this test if it would not have been for this material. It was a lifesafer." 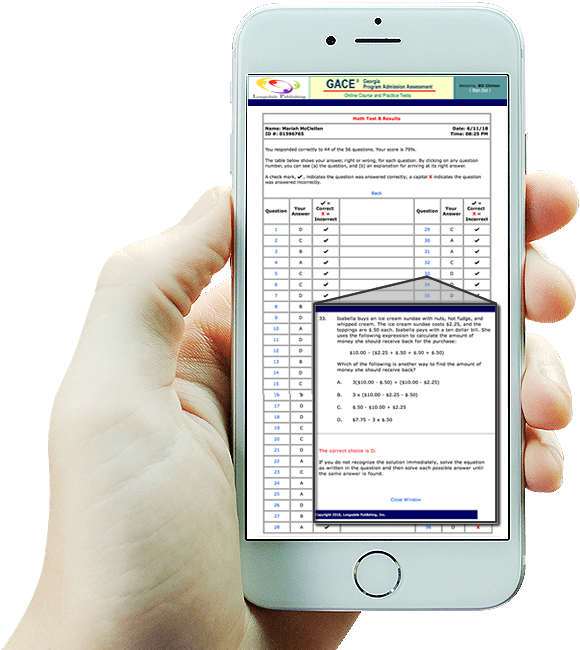 "The GACE study on line was very helpful. Thanks for having a resource that we can go to and receive help." Who writes the GACE practice questions? 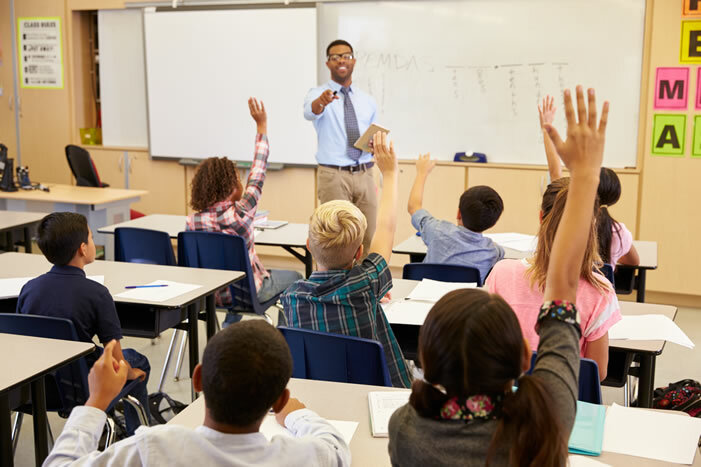 Our expert instructors, who have decades of experience and have taught thousands of students, create our GACE practice questions and explanations. Absolutely! Staff and faculty from postsecondary institutions may request an unrestricted preview of both the student and instructor sections of our GACE Online Course and Practice Tests program for evaluation purposes. Below are the annual discounted prices for the GACE Online Course and Practice Tests Site License.